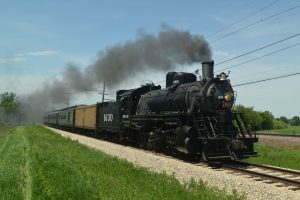 The Illinois Railway Museum’s most famous steam locomotive, Frisco 1630, has entered regular service at the museum for the 2018 season. The locomotive, built by Baldwin in 1918 for export to Russia but never shipped overseas due to an embargo following the Bolshevik revolution, is celebrating its 100th birthday this year. During the locomotive’s time out of service over the winter, volunteers in the museum’s Steam Department conducted a full in-depth inspection and performed work on the locomotive including repairs to the ash pans and tender. The locomotive has long been the star of IRM’s steam program. Acquired by the museum in 1967 from Eagle Picher in Oklahoma, which operated 1630 after it was sold by the Frisco, the engine was made operational in 1972. It has run regularly in Union for most of the 46 years since and has become one of the most popular attractions for museum visitors. It is one of only two 2-10-0 “Decapod” locomotives in operation in the United States and the only steam engine from the St. Louis-San Francisco Railway, or “Frisco,” in running condition. Frisco 1630 will be in service most weekends through September, including during the Day Out With Thomas™ event in July. The museum’s online calendar lists information on all dates with scheduled steam operation. Other equipment scheduled to operate each day is also listed. For information on how you can help the IRM Steam Department by attending the 2018 Steam Department Benefit at the Sanfilippo Estate, click here.